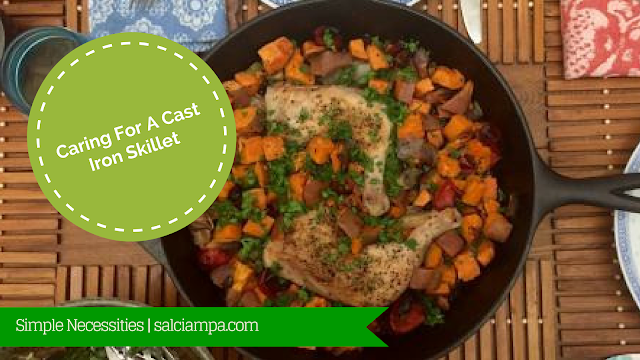 A cast iron skillet is a great tool for stove top cooking. I'm not sure if you can cook EVERYTHING in a cast iron skillet, but more. Thing to know about owning a cast iron skillet is that it does require some extra TLC. The extra care you give it, the better it works for you and longer it lasts. I came across the following video from BuzzFeed Tasty which shows you not only how to care for your cast iron skillet, but to bring it back to life if it's been neglected and rusting away in your cupboard. This video shows you the basics from cleaning, cooking and rescuing a cast iron skillet. Note: the video incorrectly says that cast iron is a good conductor of heat, but the opposite is true. While it retains heat very well, it takes a while for heat to conduct through the entire skillet, which is why it can heat up unevenly. Hence the need for preheating. Cast iron skillets can take a little more work than your average pan, but they’ll last forever and they’re versatile to work for nearly anything you need to cook on a stove top.